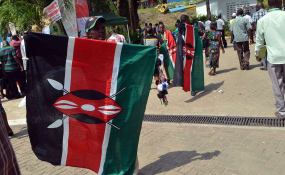 Has UK Company Copyrighted Kenya's National Anthem? A UK music company accused of copyrighting Kenya's National Anthem has come out to clear the air. De Wofle Music Company has denied owning the anthem's copyright and explained that what they posted on their YouTube channel is a sound recording of the anthem. They have not copyrighted it. The company came under attack online after a Kenyan YouTuber received a strike (warning) for using a version of the anthem whose copyright was attributed to the music company. In an email to Nairobi News, Warren de Wofle said his company does not own the rights to the national anthem and can never copyright it. "We do not own, or claim to own, the copyright to the Kenyan National Anthem, most National anthems are non copyright and are in the public domain, due either to their age, or by legislation making national symbols copyright-free. "We have a sound recording of this work but we do not claim any other ownership and have never copyrighted ownership of the composition as this in the public domain," he wrote. Warren added that the YouTuber's video was only given a strike after a music identification system picked up the usage of the recording but it has since been cleared. "It would seem in this case that AdRev's music identification systems have highlighted the use of this recording and automatically questioned whether the Sound recording has been cleared, this claim has now been reversed," he added. 2nacheki, who had used the anthem in a Vlog on Africa's best anthems, confirmed that the copyright claim was indeed resolved, sharing a screenshot of a communication of the same from YouTube. The Kenya Copyright Board had stated that the copyright claim by the UK company was invalid adding that it was in communication with YouTube over the same.